My old friend, David Wolf, recently of Fidelity Investments, but previously an Advisor at the Bank of Canada, attracted headlines last week in response to an investment commentary which he provocatively titled "Canada's Oil Slick" (see here). Wolf argues that, for many years, Canada has enjoyed a virtuous cycle: rising commodity prices fuelled a strong Canadian dollar, which boosted confidence, purchasing power, borrowing, consumer spending, housing prices and other asset prices. Now that virtuous cycle has turned vicious; all of these forces are working in the other direction. Some economists argue that the negative effects of lower oil prices will be more than offset as US and Canadian consumers get a boost from cheaper gasoline prices and Canadian exporters benefit from a lower Canadian dollar. But Wolf contends that most economists and markets are underestimating the second and third round effects: the vicious cycle of falling commodity prices, a weakening Canadian dollar, falling confidence, slowing borrowing, falling asset prices and weakening spending that will follow the crash in oil and other commodity prices. As the economy and asset prices weaken, Wolf argues, "the probability that the Bank [of Canada] does eventually have to put interest rates back at zero has increased substantially". He suggests that, "The Bank of Canada does have a bit of room left to stimulate, although it will likely be hesitant to use it in the near term, partly to avoid the risk of exacerbating the household imbalances that have grown much larger since the crisis." I believe that, in this debate, David Wolf's view is more likely to prove accurate. While I am in broad agreement with his assessment, in my opinion, he fails to mention one important link in the virtuous cycle that has turned vicious. 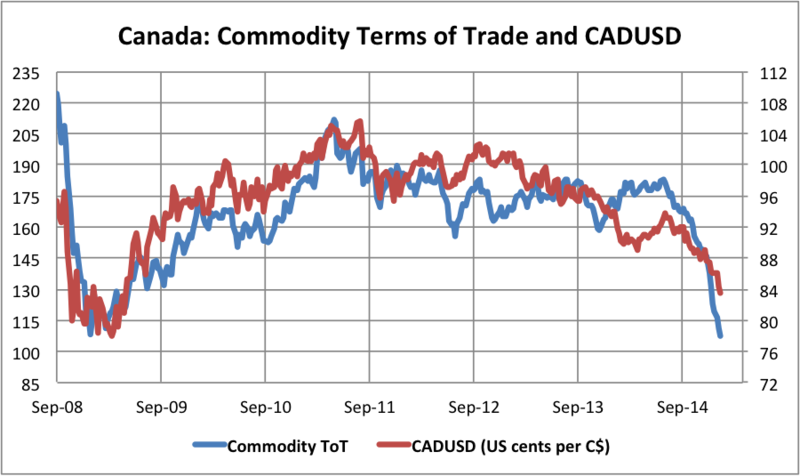 When the price of oil [and other commodities] falls, Canada's terms of trade (ToT) weakens. When the price of commodities falls relative to the price of other goods and services, the price of Canada's exports falls relative to the price of its imports. When the commodity terms of trade weaken, Canada's gross domestic income weakens. This negative shock to income is shared across the corporate sector, the government sector and the household sector. While some energy consuming industries will benefit, total corporate profits will fall. Government revenues will fall, causing most governments to curtail discretionary spending. While commuters will benefit from lower gasoline prices, the lower Canadian dollar will make imports of finished consumer goods and services more expensive. As housing and other asset prices weaken against a backdrop of record high household debt-to-income ratios, consumers will be reluctant to spend any windfall bestowed by lower energy prices. Many will prefer to save rather than spend the temporary boost to disposable income. What is noteworthy about the chart above is that the depreciation of the Canadian dollar, significant as it has been, has not kept pace with the deterioration of the commodity terms of trade. Even if oil and other commodity prices stabilize at current levels, the Canadian dollar needs to fall further, to below 80 US cents (or alternatively USDCAD needs to rise above 1.25), to have a chance to offset the negative impact of the terms of trade deterioration on growth and inflation. The Bank of Canada will make a policy rate decision and release an updated projection for the Canadian economy on January 21. The biggest change will be in the inflation projection. The table below shows the Bank of Canada's Total CPI inflation projection made in its October Monetary Policy Report (MPR) and JP Morgan's latest Canadian inflation forecast which incorporates most of the recent decline in crude oil prices. The JP Morgan forecast anticipates that CPI inflation will turn negative in 2Q15 (as I predicted here) before edging back toward 1% by 4Q15 assuming that the price of oil rebounds toward $90 per barrel by the end of 2015. If, as I believe likely, crude oil prices remain depressed for a much longer period of time, say well into 2016 or 2017, inflation will likely fall into negative territory in early 2015 and remain there for some time. With such an outlook, the Bank of Canada needs to pay full attention to defending its inflation target and supporting inflation expectations around 2%. The most effective way to do this in the near term is to provide guidance in the January 21 policy rate announcement and the Monetary Policy Report that the BoC stands ready to cut the policy rate if inflation moves persistently below the 1-3% target band. Great points Ted. As I have commented before, I have firmly been at the pessimists end of the spectrum since the financial crisis on the theme of rate normalization (there won't be any in my opinion) and any stress testing of retail commitments, builder commitments, and energy related portfolio exposures within the Canadian banking oligopoly probably do not take into account long term WTI/Brent prices at the current levels. Building upon that is a scenario of prices falling a further 40-45% from current levels and we will see a macro-economy running on fewer cylinders. Can manufacturing rescue us in aggregate? I don't think so. Focus for the future is on advanced manufacturing entailing greater productivity and less job growth and the US economy's expansion is already long in the tooth. Easy monetary policy begets further easy monetary policy with no end in sight. You are correct to point out that we need to be vigilant that a transitory drop in the headline rate does not begin to spill into core prices. There are a number of ways in which this can happen: airline and other transportation costs will fall with oil, leading to a fall in the transport component of consumer goods costs. But there are a lot of other prices that will move up: anything that is manufactured, or competes with goods that are manufactured will increase in price with the CAD depreciation. If all prices were falling, then we could expect inflation expectations to fall with them. When gas prices drop, but most everything else moves up, it is unlikely that long run inflation expectations will react. We are accustomed to large moves in energy prices, so we don't tend to assume that they will last forever. This means that the transitory fall in energy prices should not cause consumers to expect drops in all prices. Just as we looked through the price spikes in 2008 and 2011, we should look through this price fall. This provides a distinction between good deflation, where supply shock induced price falls enhance consumer confidence. It is price falls due to deficient demand that would cause people to defer consumption and this is the bad deflation we need to be worried about. The terms of trade effect will cause real incomes in Alberta especially to decline. They will have less money coming in and more expensive goods to pay for. The rest of Canada will benefit in real terms, although not enough to offset Alberta. Stimulating demand across the country with a rate cut will do little to help Albertan incomes, and much to reignite the household debt imbalances throughout the country. With the US economy still expanding and absorbing slack, and the Fed warning about rate hikes, a rate cut in Canada would undermine confidence, add volatility and further exacerbate household imbalances, none of which are good for economic efficiency. All good points, Greg. However, the magnitude of the shock means that not only Alberta, but all of Canada faces a negative shock to Gross Domestic Income of 5.8% assuming oil price of $50/bbl oil or 3.3% assuming $70/bbl. This massive shock to GDI will spread across the economy, lowering real business investment, real consumer spending. It is too big a hit to Canadian income and wealth for the BoC to "look through". Household debt imbalances would be worse if the BoC did nothing to cushion the blow to income. I applaud the BoC for the proactive stance they are taking.